Term time has officially ended and everyone is one they’re way home for Christmas. However, I love the last two weeks of the semester as they’re usually filled with lots of special events and most importantly Christmas dinners! When December starts everyone just seems to get a little happier and all the stress of midterm exams and coursework deadlines seems to be left behind. At Surrey, lots of clubs and societies organize Christmas dinners for their members. This year I joined the Tennis and Squash ones; both were at wonderful pubs and it was so nice seeing everyone all dressed up and excited for Christmas! As every year, we also had a lovely home-cooked house Christmas dinner! A typical English Christmas dinner consist of roast potatoes, Yorkshire puddings, lots of vegetables, stuffing and turkey & pigs in blankets or a nut roast/vegetable tart for the vegetarians. One more very important tradition you’ll encounter at any English Christmas meal: Christmas crackers! You cross your hands and hold on to two different ends, then everyone pulls them apart at the same time. They’re filled with a paper crown (which everyone then must wear), a little gadget and a joke. 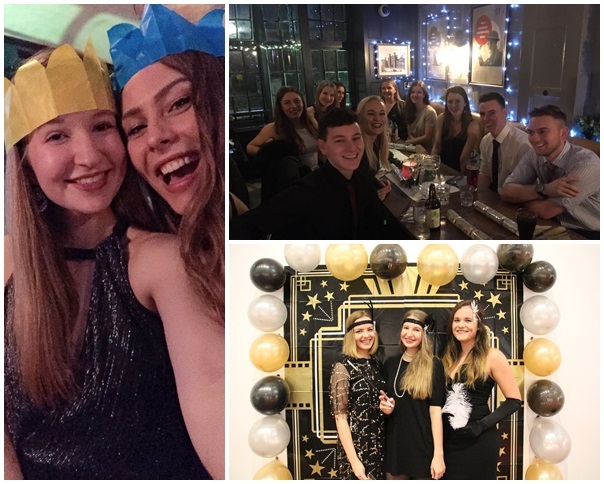 The last two weeks of Christmas are also filled with lots of other fun events, such as the evenings organized by our hospitality/event management students as part of their course. This year I attended a Great Gatsby charity event at Lakeside. They organized a wonderful event with a dessert buffet, live music and a dance performance. It was also for a really good cause, as all the profits were given to a children’s hospice. As lovely as the last two weeks of term were, I could not be more excited to go home to Munich, visit the Christmas markets and have all the mulled wine! Hope you all have a wonderful Christmas break!